It's the time of the year. Uni starts and there's bazaar almost everywhere. 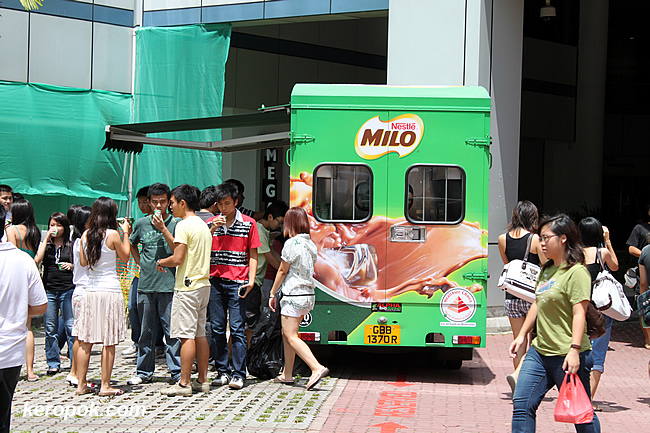 With the bazaar around, there's always the Free Milo Truck. On such a hot sunny day, a cup of ice cold milo brings smiles to everyone's face. I love Milo! Too bad it's not available here. The ones that are sold here are imported from middle east and they don't taste the same! the ones in Singapore, there's two kinds. Made in Singapore and Made in Australia version. Somehow their milo mix they serve taste extremely good!